Welcome to Wondra Dental Care, P.C., a leading dental care practice in Rio Rancho, New Mexico. We understand the importance of good dental hygiene and oral care and are committed to providing you the best care in a pleasant environment. Kirk S. Wondra, D.D.S. and his team provide an array of dental services to meet all your needs. Using the latest technology, Dr. Wondra and our staff work together as a team to give you exceptional quality treatment from the time you walk in for your initial visit. Dr. Wondra has offered same day crowns for over 10 years. When the majority of the upper tooth has been damaged and needs to be replaced, a crown may be in order. 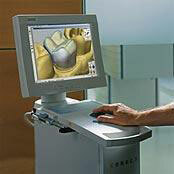 The ceramic crowns are designed and applied in a single visit using the advanced CEREC system. This dynamic software takes the guesswork out of crown design. They are almost indistinguishable from natural teeth, and the bonding process provides a superior bond to your teeth. It is metal-free for patients with metal sensitivities. The gold crowns are appropriate when appearance is not a priority. The gold metal is malleable, making them fit precisely. There exists a slight possibility (around 1 in 100) of chipping with porcelain crowns, but gold will not chip. From chipped or missing teeth to discoloration, we offer the latest techniques to correct all your dental problems. Our experienced team works together as a team to provide you with veneers, teeth whitening, crowns and bridges in order for you have a great smile. Periodontal Laser Therapy is an alternative to treat moderate to severe periodontal conditions. Dr. Wondra uses the PerioLase ND:YAG Laser which is minimally invasive, as compared to more traditional methods.